The temperatures have dropped down gradually. I like this time of the year when you can snuggle up with a bowl of warm soup and be cozy. 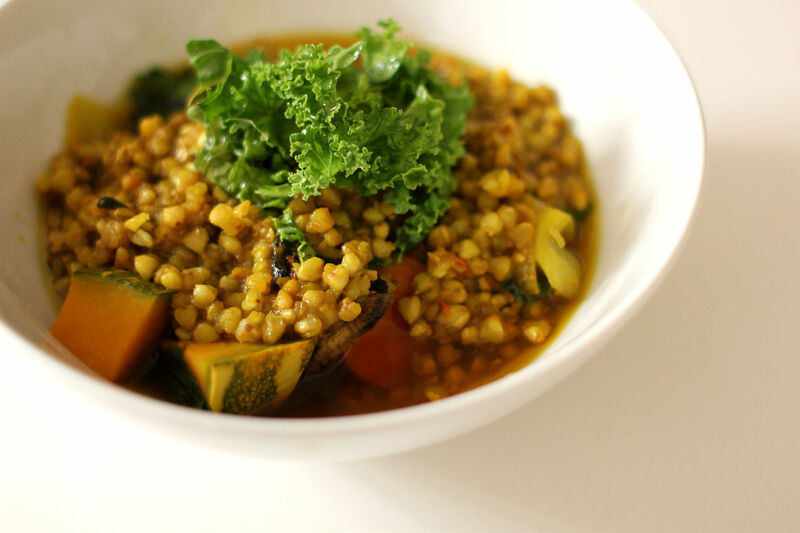 When I make a soup, I always try to add whole grains as well as lots of veggies such as brown rice, quinoa, millet and buckwheat. They not only add a nutty flavour and texture but also provide numerous health benefits. Whole grains are a carbohydrate package rich in fiber, healthy fats, vitamins, minerals, plant enzymes, hormones, and hundreds of other phytochemicals. Soluble fiber helps lower cholesterol, and insoluble fiber helps move waste through the digestive tract. Phytoestrogens found in whole grains may protect against some cancers. So might essential minerals, such as magnesium, selenium, copper, and manganese. These minerals may also help reduce the risk for heart disease and diabetes. 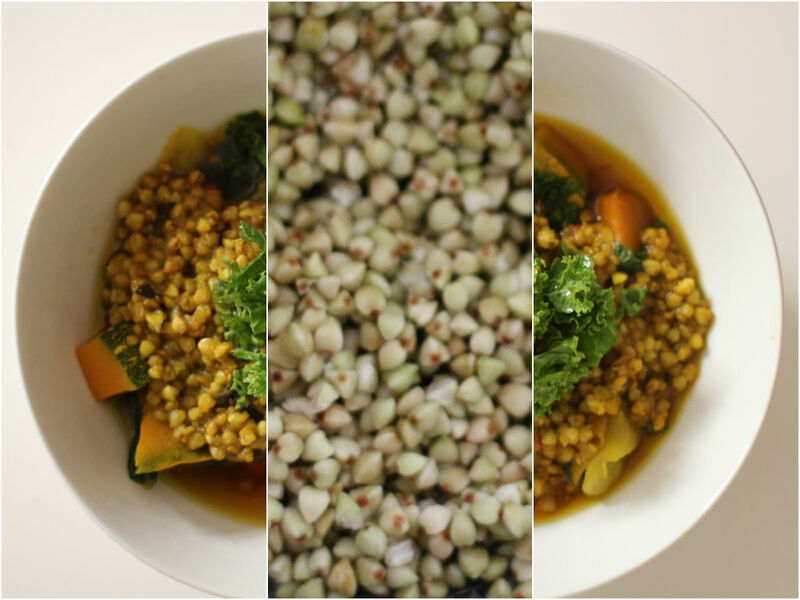 Buckwheat groats are gluten-free, high in protein and fibre and a great addition to a vegetarian meal. Its taste and texture is very similar feel to barley. You can find raw or roasted. I find roasted buckwheat groats provide a full-bodied, almost smoky flavor in the soup. Turmeric and saffron broth is great for healing and cleansing. Turmeric is antioxidant, anti-inflammatory, antiviral, antibacterial, antifungal, and anticancer. Saffron is rich in minerals, vitamins and cartoenoids, important antioxidants. It helps with a number of medical ailments such as depression, macular degeneration, weight loss, asthma and menstrual discomfort. Heat coconut oil in a large stock pot over medium heat. Add onion, carrot, pumpkin, mushrooms, garlic and turmeric into a pot and stir for 5-10 minutes until softened. Add in mushrooms, tarragon, buckwheat groats, water or stock and saffron and simmer on low heat for 5-10 minutes until the buckwheat is cooked. Season with salt and pepper. Add kale leaves and let it sit with a lid on for another 5-10 minutes. Stir, ladle into a soup bowl and garnish with more kales on top.